The Smart Motor Sensors go far beyond the possibilities of conventional motor feedback systems. We have also succeeded in bundling together additional sensor data with the globally established HIPERFACE DSL® one-cable interface for motor feedback systems. This allows real sensor fusion, which is an essential condition for truly smart feedback. The servomotor drives the process. 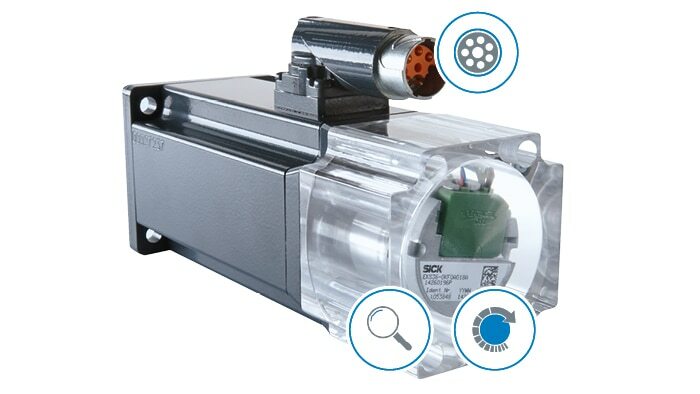 Motor feedback systems supply data for regulating and operating motors and therefore ensure a smooth and efficient process. But motor feedback systems are more than simple data providers. During operation, intelligent sensor technology not only checks parameters such as speed, safe positioning, acceleration, temperature, and the number of revolutions. Predictive maintenance and permanent process condition monitoring are also made possible with additional functions such as the electronic type label, histograms, and user-defined warnings in particular. This transforms the motor feedback systems from SICK into Smart Motor Sensors. HIPERFACE DSL® from SICK was the first one-cable interface for servomotors on the market. Since then, it has become an established product among manufacturers of motors and drives around the world. This purely digital interface offers a direct connection to the future. The innovative and interference-free HIPERFACE DSL® protocol enables communication using just two wires that are integrated into the motor cable. When you combine smart sensor technology with a globally established interface, you get Smart Motor Sensors from SICK. Smart Motor Sensors are more than just a data source from the center of the drive. Smart Motor Sensors ensure efficient monitoring at any point when something is moving in a process. In many ways, Smart Motor Sensors are therefore the enablers of the future. And the future is here. With HIPERFACE DSL®, Smart Motor Sensors are already enabling condition monitoring and predictive maintenance. Moreover, they transmit reliable speed and position values for intelligent Safe Motion monitoring on the machine. The machine design is more compact thanks to the lack of a second motor connector and a separate encoder cable. Speed and position information enables safe machine control. HIPERFACE DSL® minimizes cabling, as sensor data is transmitted via the motor cable. Smart Motor Sensors are at home in all industries. 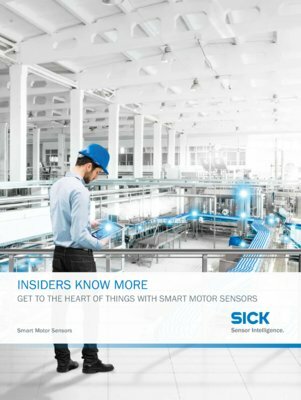 At first glance, this is often not apparent – and yet the intelligent sensors and innovative interfaces from SICK are used in countless servomotors produced by different manufacturers. This provides a wide variety of industries with a crucial boost when it comes to achieving success in production. Smart Motor Sensors meet all the requirements for successful use in Industry 4.0 applications. The most important requirement in this case is HIPERFACE DSL® – the purely digital interface that sends measurement data directly via the servo controller to the cloud or the Ethernet network. On this basis, production processes will be able to network with one another in the future in such a way that they will also work independently. The development continues. At SICK, the sensor hub is known as sHub and is the expansion stage for Smart Motor Sensors. It bundles the data from Smart Motor Sensors and other sensors that are built into the motor. This enables a true sensor fusion. The sHub “collects” data from Smart Motor Sensors, such as information on safe position and speed, as well as data from other sensor technology, such as temperature, shock, vibrations, and moisture. The sHub transmits this bundled mass of data via the existing HIPERFACE DSL® data cable synchronously to the drive. 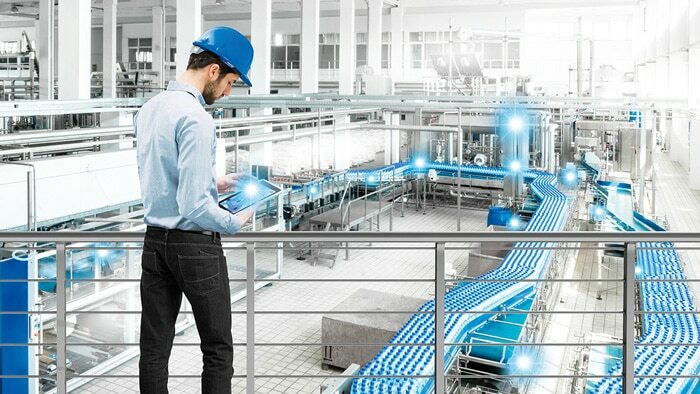 Smart Motor Sensors and sHub are therefore important components as we move towards the Smart Factory in Industry 4.0.